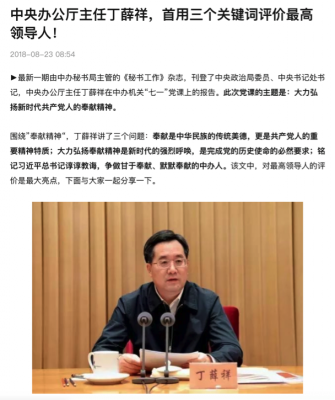 Back in June this year, ahead of the July 1 anniversary of the founding of the Chinese Communist Party (CCP), politburo member Ding Xuexiang (丁薛祥), director of the CCP’s General Office, delivered an instruction talk, or dangke (党课), to a group of offiicials. The substance of Ding’s talk was not made public at the time, but when it did surface several weeks ago it generated a lot of hubbub and discussion online. Why the interest? 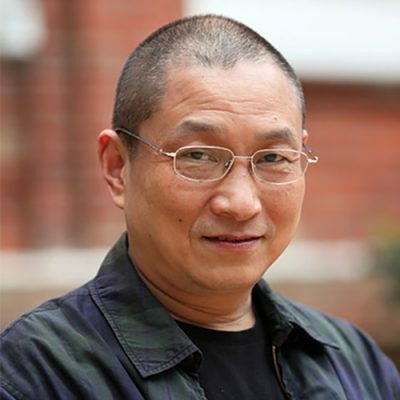 Because Ding’s remarks, and how they have subsequently been treated in China’s political discourse environment, again provide clues to the political environment in China. The point of keenest interest as news of Ding’s remarks made the rounds was the language he used to describe President Xi Jinping and his leadership. “Having read the works of General Secretary Xi Jinping, having listened to the general secretary’s instructions, coming to appreciate the general secretary’s feelings, I have a rather deep understanding of the general secretary’s longstanding devotion, his continued devotion, his selfless devotion,” Deng said. “goes willingly into a sea of bitterness” (甘入苦海) — meaning Xi takes a courageous and good-humored attitude to adversity, bravely facing it. ”dedicates himself to the cause of the Party” (以身许党). Ding Xuexiang has a rather elevated status within the Chinese Communist Party, and the three terms he employed in praise of Xi Jinping naturally drew some interest in light of general questions about Xi’s strength and stature within the leadership. But the pattern of propagation of these three terms online was also an area of interest. What does this pattern tell us? First, we can see that the “three terms” were not propagated broadly across the usual platforms one would expect once news of Ding’s remarks emerged. If the terms were coming into broader “mainstream” use — as part, that is, of the Party’s official line — then we would expect to see the terms used and explained at People’s Daily Online, Xinhua Online and on official WeChat accounts and the like. But reports on Ding’s speech were carried instead by commercial portals such as Sina, Netease, Sohu and Phoenix Online. And if we probe further, turning to a national database of newspapers for the entire period following Ding’s speech, from July through to the end of September, we find that not a single paper used Ding’s “three terms” of praise for Xi. So the terms are absent not just from high-level, central Party media, but also from provincial and city-level Party newspapers. Some websites have suggested that Ding’s speech was “an internal speech” (内部讲话). But this is in fact untrue. It was a public speech published in Secretariat Work (秘书工作), a journal run by the Secretariat of the General Office of the Central Committee. But when I conducted a targeted search within this website, I discovered something strange. The edition including the Deng Xuexiang lesson should have come out in July. It is now October, but the July edition has yet to appear on the journal’s website. 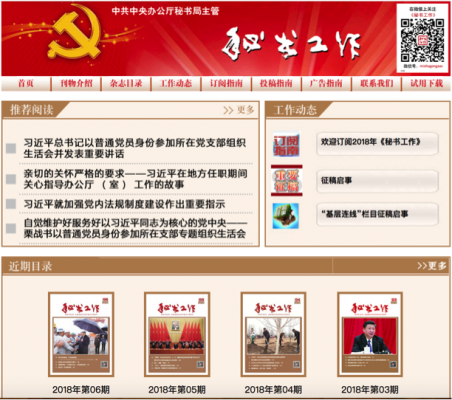 The period immediately after last year’s 19th National Congress brought a wave of personality worship (个人崇拜), and the three terms used in praise of Xi Jinping at the time were: “endorsed by the whole Party” (全党拥护), “love by the people” (人民爱戴) and “worthy of the title” (当之无愧). For a brief time, a number of local and regional media even used the highly honorific phrase “great leader” (伟大领袖). But these three phrases rapidly cooled off, possibly due to a personal directive from Xi Jinping to make it stop. Last month, just three local newspapers in China made use of these particular terms. So how do we explain the pattern we are witnessing here with Ding’s remarks on Xi Jinping? It could simply be that now is not the time to stroke Xi’s ego or elevate his greatness — any more, that is, than is already being done. In July, Xi Jinping faced numerous challenges. So the personality worship still continues in all sorts of ways, but it may lack fresh kinetic energy. At the outset of the Cultural Revolution, Lin Biao (林彪) praised Mao Zedong for “defending and developing Marxism-Leninism with genius, with creativity and with totality” (天才地、创造性地、全面地继承、捍卫和发展了马克思列宁主义). This was a high compliment, and at that time “with genius, with creativity and with totality” (天才地、创造性地、全面地) became “the three adverbs” (三个副词) used in praise of Mao. But as Lin Biao and Mao had their falling out, Mao saw that the “three adverbs” were struck from official documents, and he indicated that he found the “Four Greatnesess” (四个伟大) used to praise him “disagreeable” (讨嫌). 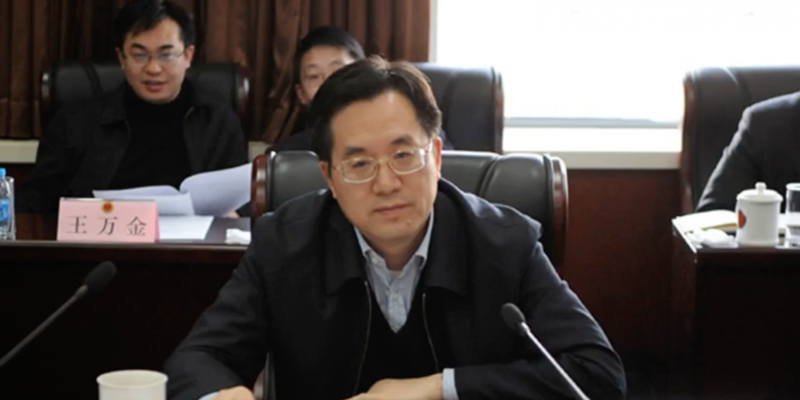 For now, Ding Xuexiang’s three terms of praise have gotten the cold shoulder from official media at all levels. Being on the outside, it is difficult for us to know exactly why. Is this something compelled by the circumstances? Or is it that Xi faces headwinds within the Party? Or is it, perhaps, just that Xi Jinping finds these three terms “disagreeable”? NextHow Will China Respond to the Victor Mallet Case?